Published in The Star Newspaper South Africa January 1932. Saturday’s ceremony of “Trooping the Colour” brings to mind that four months ago the trooping of the Appin banner and its dedication to Scotland’s National Naval and Military Museum links the traditions of the Transvaal Scottish with the romantic incidents of the Jacobite Rising 1745. It is the Atholl tartan which the Transvaal regiment wears by the favour of the Duke of Atholl and by virtue of descent through the Scottish Horse from the hereditary regiment His Grace is privileged to maintain. The Duke through his ancestor James Lord High Steward of Scotland is also the head of the once powerful Stewart clan of Perthshire and from the common origin is a cousin to the famous Scottish West Coast clan of the Stewarts of Appin. When the hopes of the exiled Royal House of Stewart was smashed forever by the soldiers of the Hanover monarch and the great Clan Campbell both the clans of the Highland Stewarts were conspicuous for the ferocity of their charges against the English regiments. The Stewarts of Appin lost a hundred and fifty-seven men storming their way into what it is now the King’s Own Regiment then commanded by Colonel Barrel. Ten clansman in succession died carrying the banner of their chief until when the redcoats and dripping bayonets of Barrel’s men swept victoriously over the shattered Highlanders an Appin man Donald Livingston an ancestor of the African Explorer Missionary tore the bloodstained rag from its staff wrapped it around his body and hacked his way through to open country. For a hundred and eighty-five years the family of the Appin chiefs have cherished the heirloom but economic pressure, at last, caused the present Stewart of Appin to appeal to those of his name to take over the valuable and historic relic of their race. 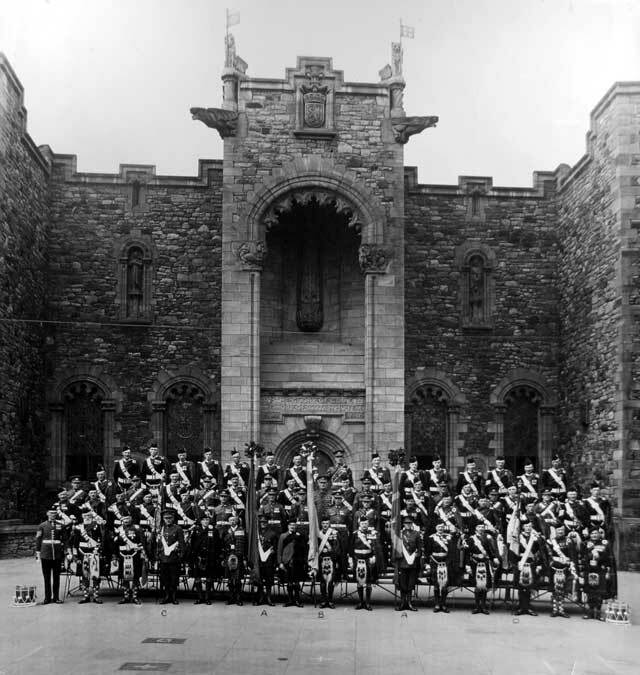 The Stewart Society headed by the Earl of Galloway responded immediately and after purchase unanimously decided to obtain the Culloden Colours of Barrel’s regiment and in conjunction with the King’s Own Regiment lay the flags in honour in Edinburgh Castle. 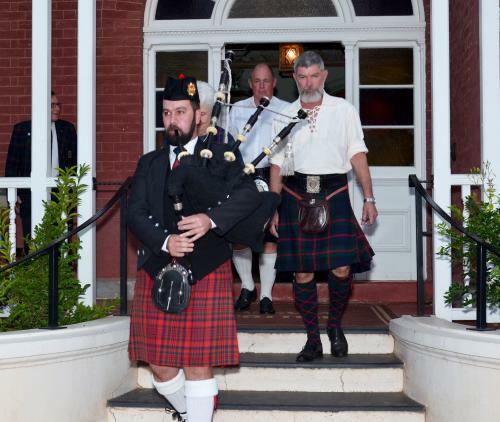 It is seldom nowadays that so picturesque a ceremony is seen as that of the dedication. Thousands flocked to the same viewpoints which nearly two centuries ago other thousands saw with mixed feelings the standard of Prince Charles Edward Stuart, son of a long descended kings carried by a common hangman and a dozen ancient clan banners born ignominiously by the Citys’ chimney sweeps to their burning at the Market Cross. Time has changed the memory of bitter feud to the honoured remembrance of the sacrifices made by ancient foes to idealism. In 1745 Edinburgh citizens scowled or slunk in terror from the sight of Highland tartan. From the grey castle, cannon roared angrily at clusters of kilted soldiers gathering below the naked rock. There was a Duke of Atholl with the Stewart Prince and a Duke of Atholl with the Hanoverian Monarch. Murrays and Stewarts, McDonalds and Camerons panted with bloodlust to get at the throats of Campbells, Rosses and Munroes. Scarce a year later and the bonnie Hielan’ heather was filled with hunted outlaws, the glens reddened with the blood of their sons, filled with the wailing of women and little children, the star of the Stewart race sinking in a chaos of blood and fire and terror. Not two centuries have passed. There is yet Highland folk whose great grandfathers fought at Culloden yet what is more honoured in the wide-flung British Empire than the Highland tartan? Highland regiments from Fontenoy and the taking of Quebec to even beyond the ending of the great 1914 to 18 drama have played a foremost part in the upholding of the Royal Standard of the reigning British House. It is only fitting therefore that the memory of the valour displayed on a thousand battlefields should be marked by the ceremony of the 1st of August 1931. So in the presence of many thousand loyal citizens, the Atholl Regiment of Highland descendants of Prince Charlies’ soldiers paraded the historic square of Edinburgh Castle as a guard of honour to an ancient rebel banner and the colours of the English regiment which broke their ancestors. To the salute of the Atholl pipers and the Present of the clan soldiers, men in the glittering dress of Highland chiefs entered the square to take positions of honour. Men whose names and titles a hundred and eighty five years ago were those of proclaimed traitors and outlaws whose very national dress was forbidden to their people, Stewart of Appin, Stewart of Achnacona, Stewart of Fasnacloich, Lord Elcho, with them the Duke of Atholl, descendant of Lord George Stewart Murray, Commander in Chief of the rebel army and of his brother who preferred loyalty to a ducal title honour rather than lands and riches. Next to them gathered Lieutenant General Sir Percy Ratcliffe, General Officer commanding the Scottish Command. Major General Barrett, Colonel of the King’s Own Regiment, the Very Reverend the Dean of the Thistle Lieutenant Colonel Balfour Paul, Falkland pursuivant Major Alan MacGregor Whitten A.D.C. To the stirring Jacobite tune of The White Cockade, the colours of the Atholl Highlanders were born onto parade by Lieutenant Neil Ramsay escorted by an armed guard. Rifles dropped to the Present – a halt – then as the guard came back to the slope the pipes wailed the saddest of laments Mo Dhachaidh and slowly the colours were carried to their position on the west side of the Castle Square. Through the following stillness broke the piercing battle scream of the old Highland warpipes “Gabhaidh sinn an rathad mor” to which the clan was piped into the Culloden charge filled and rolled about the stone grey castle walls, echoed in the ancient towers as Sandy Stewart the veteran hereditary piper to the Dukes of Atholl played in the guarded faded banner of his race. Torn by English bullets, stained with Stewart the colour looked proudly from its chaplet of the Stewart emblem of oak leaves resting on a bridal bed of pure white satin. (We will take the high road) is part of the Grant collection. As the pibroch stilled the drums and fifes of the King’s Own Regiment rung from without the gates. In their guard of red-sashed Colour Sergeants two lieutenants of the 2nd battalion of the King’s advanced the ancient colours of their regiment followed by the present regimental colour strongly guarded. A combined salute with Colours advanced to the War Memorial with its many Afrikaner names amongst the Scottish heroes. A dedication service by the Dean of the Thistle then again the parade was called to attention. 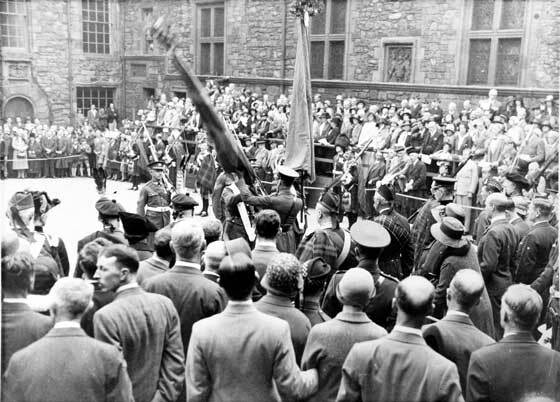 Moving across the Square came the battle flags of “Barrells Blues” wheeling before the saluting parade the colours halted then one after the other were handed by General Barrett to his Grace the Duke of Atholl. Borne by Major Lord James Stewart Murray brother of the Duke the Colour-party of the Appin banner moved out from the Atholl regiment wheeled and halted before Stewart of Fasnacloich at the Museum door. 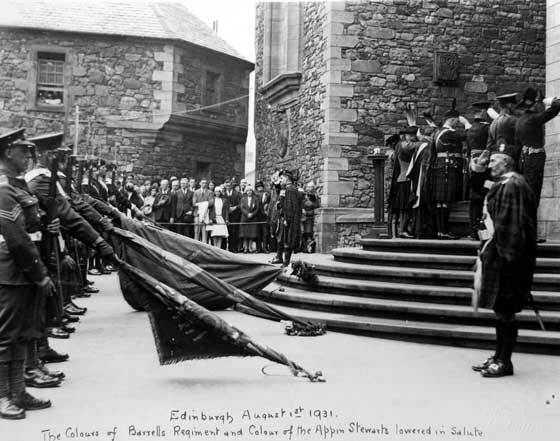 Taking the banner in his right hand from Lord Stewart Murray Fasnacloich handed it to Achnacone who in turn gave it to the Clan Chief Stewart of Appin who presented the banner to the Duke. Then forming a column of a route the feudal regiment of Atholl Highlanders with the regular soldiers of Britain marched from the old Castle drums beating present day colours flying bands playing. And in Edinburgh Castle repose in peace the emblems of two ancient and fierce antagonisms which, as the Dean of the Thistle in his stirring address pointed out, though once they distracted the Scottish nation were reconciled in that honour which generous hearts recognised was justly due to loyalty, self-sacrifice and duty.